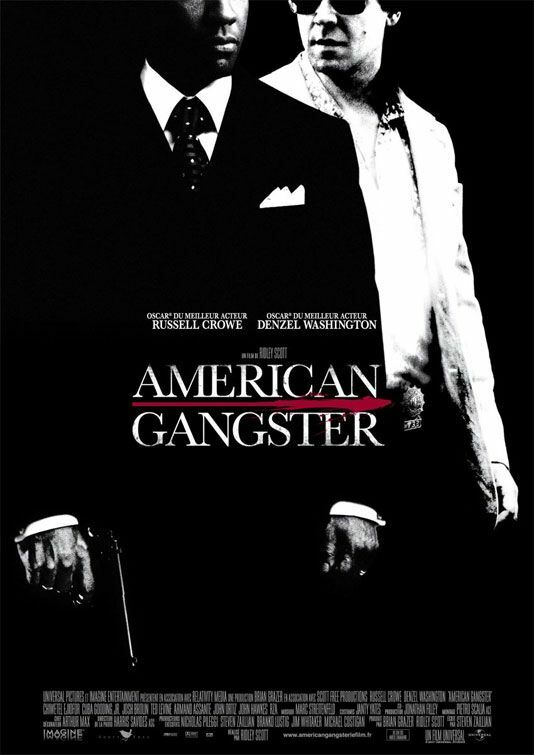 American Gangster is proof that heritage does not indicate quality. It’s going to play havoc on genetic engineering theory. The film stars Academy Award winners Denzel Washington and Russell Crowe. It’s written by the Oscar winning writer of Schindler’s List Steven Zaillian and directed by Oscar nominee Sir Ridley Scott. It’s a gangster movie about an underdog coming out on top. So how could this film be anything but brilliant? And yet… American Gangster is anything but brilliant. The film follows the story of small time hood Frank Lucas (Washington), a driver for the top crime boss in Harlem during the 60s. In 1967, when his boss dies while extolling the hazards of monopolies and the economic disaster of cutting out the middle-man, Lucas decides something must be done. Inter-cut with this story is the tale of Richie Roberts (Crowe), a good, clean cop, who, while attending night classes at law school, is also going through a divorce. Life is stacked against him and he compounds things by “doing the right thing” and turning in a million bucks in unmarked bills. So we’ve got a gangster on the rise, a cop no one trusts and, half a world away, the Vietnam war is raging. At home, though, in Harlem things are running amok. Without a boss to keep things in line, it’s “every gorilla for himself.” Lucas figures the time is right to make his move and take everything he learned at the elbow of the big man to start his own operation. He does this by importing heroin directly from the source. He provides a better product at half the cost and soon, he’s the top man in New York. Even the Italian families were sacred of him. The problem with all this is that the talent really is there. I’m not normally a Russell Crowe fan and he turned in an amazing performance. Denzel Washington is always interesting and his portrayal of Lucas is no exception. The supporting cast is also outstanding. Any of the B players, including Chiwetel Ejiofor, Josh Brolin, Ted Levine, Ruby Dee and the inimitable Joe Morton, could hold their own as the lead in a film and many have. So what happened? No one can say for sure, but it feels like everyone involved was expecting someone else to step up to the plate first. With this kind of talent involved, everyone was given a pass and no one was left to vet the people behind the scenes. Ridley Scott has created some of the most iconic films of the past 30 years, includingBlade Runner, Alien and Thelma & Louise, and Zaillian is one of the most sought after writers in Hollywood, yet both of these men fell down on the job. Well I’m not going to give them a pass. This should have been hit out of the park and instead was an infield grounder thrown out at first.